1. The girlies and I are going to the movies tonight to see Wreck it Ralph...or Rise of the Guardians.....but probably Wrek it Ralph. 2. I finished my trainer credential class. :) I just have a few webinars to do and send some paperwork off and I'll be able to do PD trainings for schools and child care facilities. 3. I had an awesome Cyber Monday. I got THE big present for someone. I'm so excited about this. It is hard for me notto let people open presents early. I just get so excited. 4. I'm going shopping tomorrow. I have all my presents except 3 and I think I can be done tomorrow. 5. I had a fabulous Wednesday night with Greg. He had friends over and we drank and they played music and he sang....it was like old times again. On a side note our Elf is still being extremely naughty. She demanded to do shots with us....How can you say no to that face? Seriously I wouldn't say no I'd be afraid she'd kill me in my sleep. 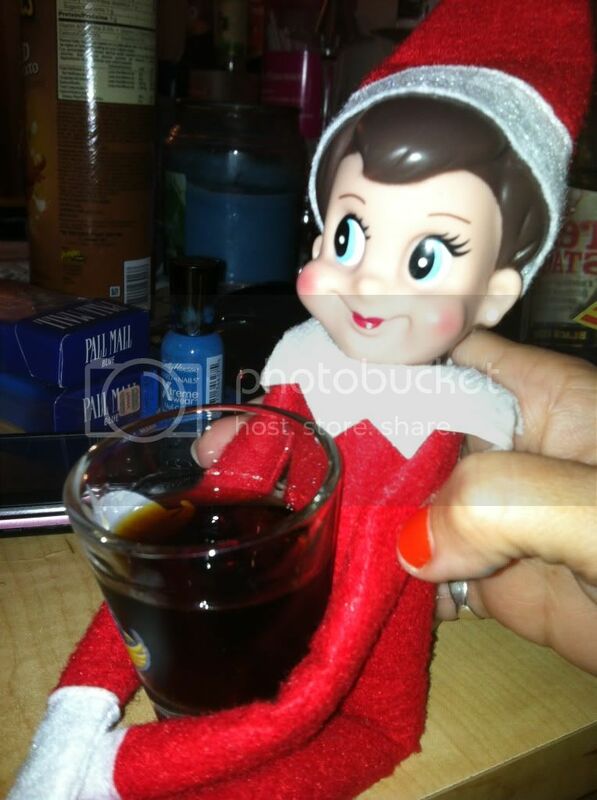 I'm guessing the flushed cheeks are from the "Christmas cheer" she's drinking!